Gregorio Rocha, Los rollos perdidos de Pancho Villa, 2003, black-and-white and color film, 49 minutes. WITH LOS ROLLOS PERDIDOS DE PANCHO VILLA (The Lost Rolls of Pancho Villa, 2003), Gregorio Rocha has constructed a fascinating document of the intertwining histories of cinema, politics, and culture. 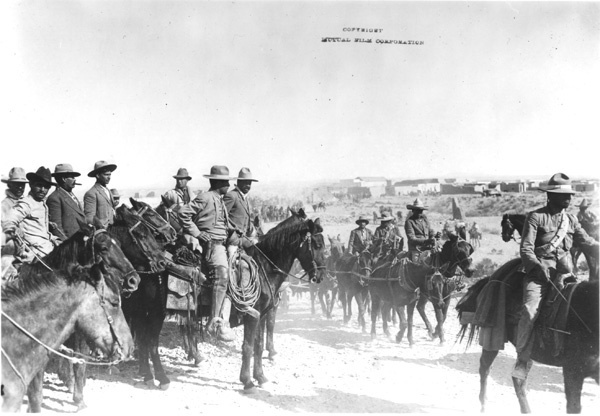 The film grows out of a surprising contract made in 1914 between the Mutual Film Corporation and Pancho Villa, in which the leader of Mexico’s Constitutional Army granted the company exclusive rights to film him in exchange for 20 percent of the profits from any resulting movie. From this odd agreement came The Life of General Villa, 1914, a heroic portrayal of Villa’s life that included select footage of the Battle of Ojinaga. In subsequent American movies, after Villa’s troops invaded Columbus, New Mexico, in 1916, he was portrayed as a villainous bandit from across the border. Rocha’s film documents his exhaustive search for the original Villa footage. In it, the Mexico City–based filmmaker travels to New York, London, and Amsterdam, only to return home empty-handed. His funds depleted, Rocha begins to audition actors for a new Villa picture when an anonymous phone call inspires a change of direction; he heads to Texas, where, in a dusty garage, he discovers a remarkable, patched-together film. Decades before reality television warped our vision of truth in media, a father-son team, Félix and Edmundo Padilla, fused artifice and history to make La venganza de Pancho Villa (The Vengeance of Pancho Villa), 1937, a clever pastiche of newsreels, clips from The Life of General Villa and graphic footage excluded from that film, scenes from the patriotic American movies The Birth of a Nation (1915) and Liberty (1916), and new footage shot in Texas. The Padillas renamed fictional Mexican towns and heroes in the American movies after their original counterparts, and they re-created Villa’s assassination. The film turns stereotypes—principally those of the Mexican bandit and the innocent American girl—on their heads, and returns Villa to heroic revolutionary status. A phenomenal example of early appropriation, it had languished in a bin until Rocha unearthed it on camera—not unlike the Padillas’ film, his own merges cinematic activism with engrossing narrative. Gregorio Rocha’s Los rollos perdidos de Pancho Villa and Félix and Edmundo Padilla’s La venganza de Pancho Villa play Monday, May 3, at REDCAT in Los Angeles. For more details, click here.